How come my cream won’t be whipped to fluffy, but remains watery instead? Are there any tips on how to make whipped cream? These are the questions I received a while ago. After posting those three no-churn ice-cream recipes, a few readers asked me to what extent we have to beat the cream. 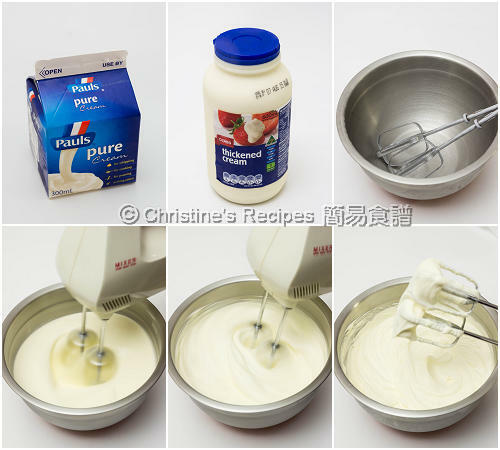 Answer: For the sake of mixing with other ingredients at ease, we only need to whip the cream until the volume is increased, very fluffy with soft texture. That’s so-called “soft peak” stage. As those no-churn ice-cream recipes are very forgiving, you won’t fail even if you beat it to form stiff peaks, yet not too stiff, as you’ll find it’s very hard to combine with other ingredients as a result the texture of the end product won’t be smooth as expected. The cream on the strawberry custard pastry I posted previously was whipped till the so-called “stiff peak” stage. 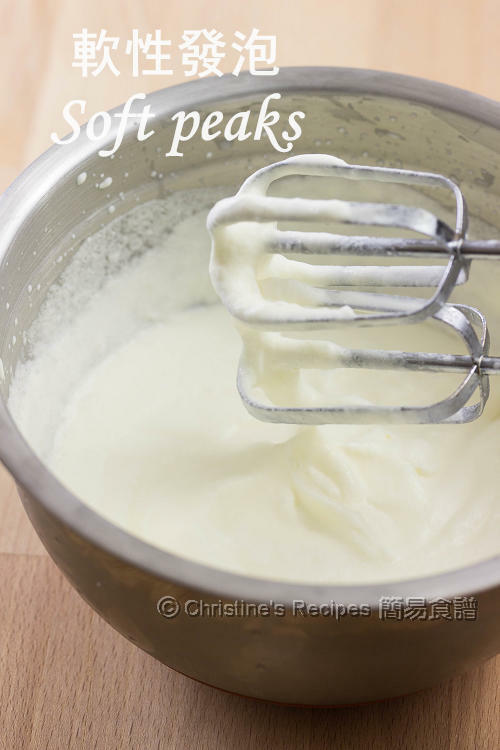 If you feel your head starting spinning between the two terms “soft peaks” and “stiff peaks”, like how I felt way back to when I started to learn whipping cream, you and me are on the same boat. What is soft peak? What’s stiff peak? How do they look like? Use heavy cream or whipping cream. They contain enough milk fat content, at least 30% or more. If the fat content is not enough, you can’t beat and create foam. Cream contains thickening additives, such as gelatine, called thickened cream. It’s very good for whipping. It won’t curdle or split easily either. You may choose this kind of product if yielded by the recipe. Chill the whisk and mixing bowl before whipping. If the weather is too hot, place the mixing bowl on a bed of ice-cubes, avoiding the cream from melting. Beware: It’s very quick to reach stiff peak stage from soft peak stage. If the amount of cream is very little, it’ll change in a blink. Once your cream is beaten to stiff peaks, stop there and avoid over-whipping because the cream will start getting grainy texture and quickly separate into butter. The whipped cream can be chilled in fridge with cover for up to 24 hours. By adding some sugar while whipping, your cream will be more flavoursome, perfect for decorating cakes or serving with desserts. Love this back to basics post, Christine. Thanks for sharing! Hi Christine. Thanks for the guide. Could you tell us whether we should whisk at a low speed, then gradually increase the speed or straight away whisk at high speed but at shorter time? Start at a low speed, then gradually increase to medium. Then your cream won't be splashed everywhere. 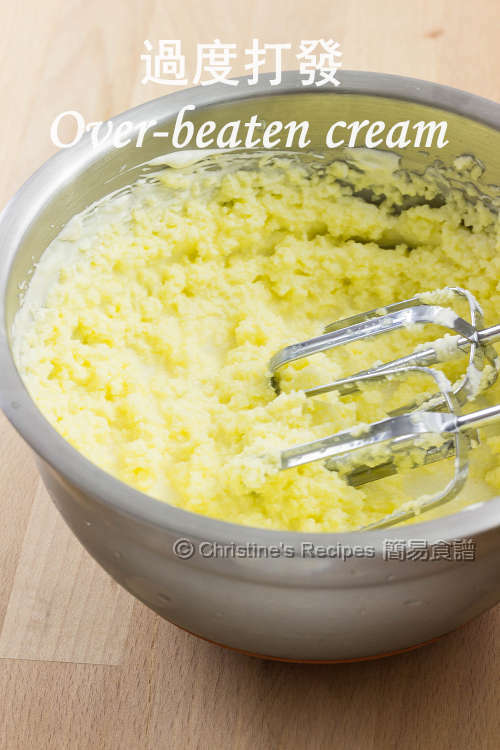 As cream can be over-whipped very quickly, I often don't use high speed, especially towards the soft peak stage. Medium speed is enough.